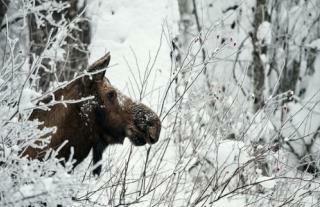 (Newser) – Heavier-than-usual snowfall in Alaska this winter has created what officials are calling a moose crisis. Starving, weary moose are heading for roads and railroad tracks to escape the deep snow—up to 6 feet in some places—and the number of vehicle-moose collisions is soaring. The state has given the Alaska Moose Federation permission to set up feeding stations to lure moose away from roads, reports the Los Angeles Times. Two months ago, I was reading about the threatened polar bear because there was no ice and snow. Oh, that's right - this is not climate change, it's just weather. It's only climate change when weather favors bogus theories. My only regret about not being able to live another 100 years is that by then some of you would have figured out that climate on earth is ever changing, with or without man. This looks like a job for...Serial-Quitter-Mom-Governor-Ubetcha-Girl! Fire up the chopper, Sarah!! Load up the .06!! Moose stew for everyone!!! !